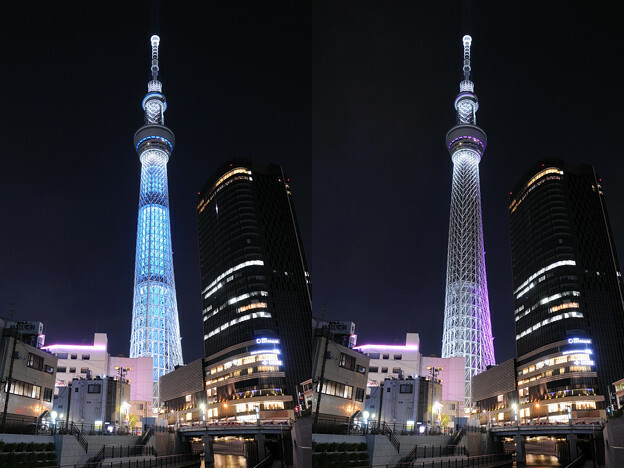 The Sky Tree is the new broadcasting tower of Japan. At 634 meters, it is the world’s highest free-standing broadcasting tower. The tower took four years to design, and 3 years 8 months to complete. Almost 585,000 were involved in the construction. The pillared earthquake-proof design is inspired by the five-storied pagoda of Horyu-ji Temple. The sleek design is inspired by a Japanese sword. There are two kinds of observation decks at the Sky Tree. 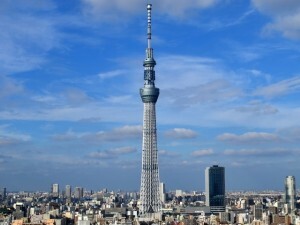 ・”Tokyo Skytree observation deck” in 350m above the ground. 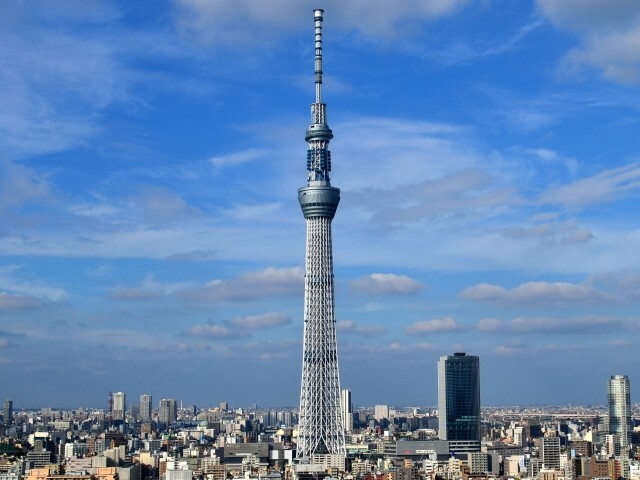 ・”Tokyo Skytree observation circuit” in 450m above the ground. The cityscape of Tokyo to look at from 450m above the ground is a superb view !! The buildings look like speckles from that high up! There is an official souvenir shop on 1F, 3F, and the observation deck on 345m. 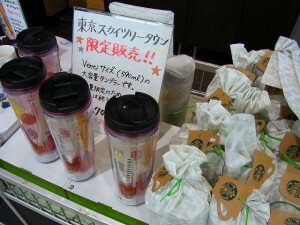 Cakes and miscellaneous goods, limited products are on sale. Some of the items are only sold in each store, so be sure to go around to each when you have time! 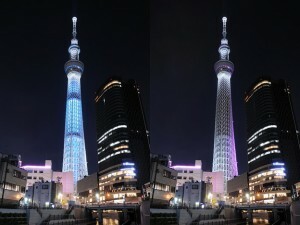 The highlight of the Skytree is when it is lit up at night! There are two types of illumination during the regular season (more for special events). The two designs alternate daily. It is one of the senses of beauty of Japan with “Iki”. An appearance and behavior are refined…Knowing human empathy…Knowing how to play…”Iki” means that I feel that you are cool. Blue light is picked up in a motif faintly in the Sumida River flowing through Tokyo by the inside. “Miyabi” means the thing that is Japanese-style, and is refined, and is elegant. The delicate design of the steel frame and light studded with in a good balance are lighted up by purple. 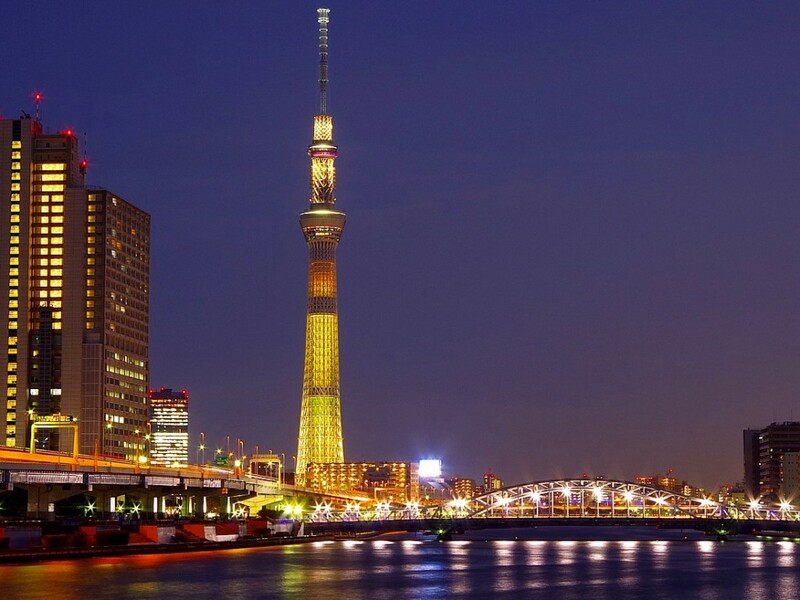 The business hours of the Sky Tree until from 8:00 a.m. to 10:00 p.m. The last entrance until 9:00 p.m.
Business hours may be changed for circumstances in a strong wind and the weather. It is crowded in the long consecutive holidays. Let’s go out with a space at time. I check the weather forecast. 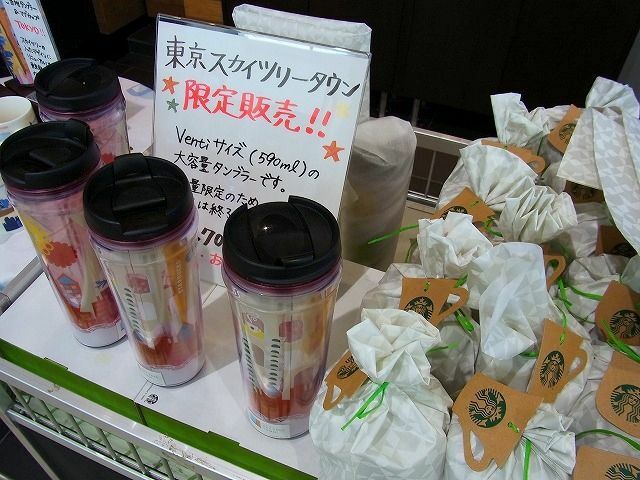 It is the tourist attraction that you should go by all means if I grind Tokyo Tours!